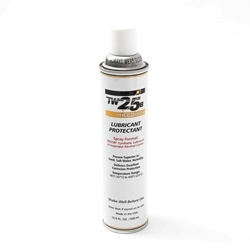 TW25B® Light Synthetic Grease is Mil-Comm Products’ original formula and a top selling firearms lubricant worldwide. Its exceptional performance in adverse conditions has made it the choice of the U.S. Military and its Allies. TW25B grease is proudly MADE IN THE U.S.A. The EP spray contains TW25B® Light Synthetic Grease in a hearty, special blend, pre-mixed with pure isopropyl alcohol, which acts as a cleaner/degreaser and helps to deliver an even, moderate coating of TW25B to treated surfaces. The combination of TW25B grease and alcohol perform as a "CLP" with the alcohol acting as the Cleaner and TW25B grease providing the Lubrication and corrosion Protection.